This allowed for a quick start of new users as well as fast handling for seasoned operators. As little probleme were collisions with the letters. But with a little bit of creativity, I could solve that: one example was the „Order – Resurrection“, which allowed to create a new order from an old one…something that happens quite often in a printer’s shop for writing paper. There were also failures: the attempt to „rewrite the whole project in a clean way“ failed spectacular. A few years later Martin Fowler’s Refactoring gave the anwer to „Why did it fail?“. Luckily, the time last was limited – other companies were not so lucky, like Lotus or Novell. Speaking of Novell, the software became multi-user capable a few years later. And far into the 2000s a MARS NWE did run in the print shop. Martin if you read this: I was the one who sent you a complete Novell Netware 3.x package with manuals and floppy disks, so that you could test better. Many thanks for your work, it helped us a lot! Among the customers of the print shop were also the first companies that got their management software written by me. Altogether about 10 programs that had quite unique requirements. But most of the code was identical so that I introduced modularization quite early. Today from these customers only one is left that now uses the software for 25 years: the Wind Saarbrücken, a retail store for sports wear, snow- and skateboards, bathing suits and more. Here I’ve created the first network connection between different locations. Back then with ISDN and a self-written database technology, which you would call eventual consistency today. All that ran on OS/2 which was the first (affordable) PC-OS that allowed real multitasking. A few years later it was replaced by Linux which still runs today. Dosemu and Dosbox were used to run the software. The till was opened by a self soldered cable and a bit of assembly (!) code. A bit unconcerned but ran for quite some years without any hiccups until it has been replaced by a receipt printer with a dedicated port for tills. 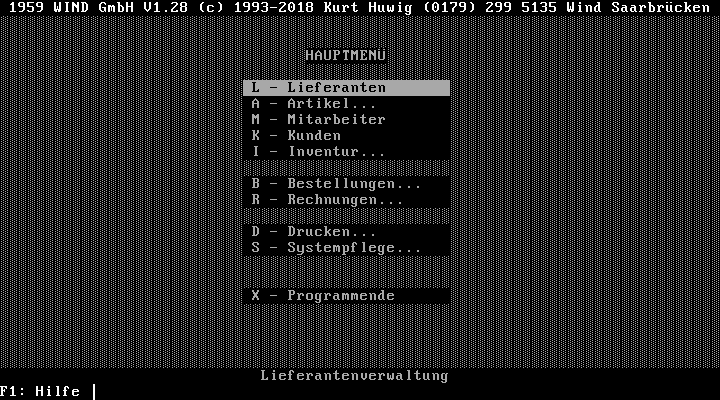 The receipt printer was also fun to integrate: as there were no printer drivers on DOS I had to manually (ok, with a little programm I wrote) convert the logo into the correct format. While printing an invoice the DOS-program reads it from a file and sends it to the printer unchanged – works like a charm for several years now. The last change was the switch to Harbour so that the software could be run natively. Not only to be able to use a compiler from this millenium, but also so that the program did not run in an endless loop waiting for input. This can be heart by the sound of the fans as well as the power consumption. Will the software survive another 25 years? Nobody knows! But it the Wind served faithfully and is currently been used by the third management. Best wishes for the future!